STORY: Unknown to the participants, while the previous "tournament" was occurring, they were being watched by another sinister group simply known as the "Organization". The Organization intended to summon their dark god to earth in order to wreak havoc. In order to do this they needed a pure-hearted boy to use as a vessel and the blood of strong fighters. For the former they targeted a boy named David. 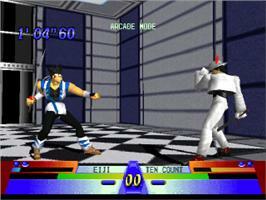 For the latter, they chose the Toshinden fighters. 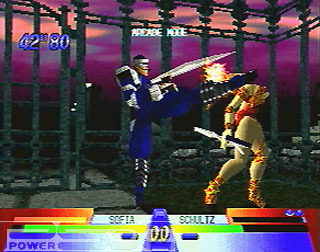 The Organization trained assassins in the Toshinden fighters' fighting styles. Led by their leader Abel, they set out to try and capture the Toshinden fighters. 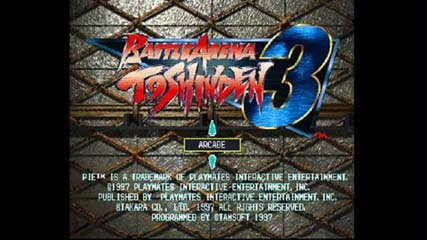 The classic Toshinden font returns once more! REVIEW: The third installment to the Toshinden series adds a ton of new characters to the classic line-up, giving the game a much different vibe from the prequel. There are 14 characters to start off with, and through playing the game, you can then unlock 18 additional fighters, making for a total of 32 selectable characters (a very impressive number in 1996 / 1997). 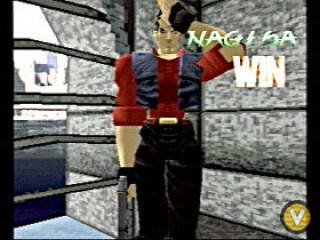 Along with all the new characters, Toshinden 3 presents a bold new gameplay element. The stages of Toshinden 3 implement walls and ceilings for the first time in the series history. 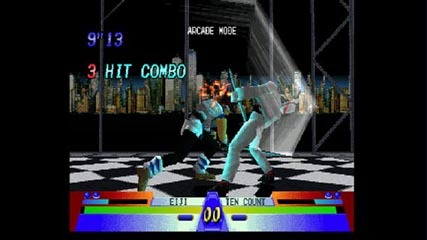 The new stage designs promote new combo possibilities and gives the game a "different" feel when compared to many other 3D fighters of the time. I personally think the new enclosed stages give the gameplay a "cramped" sort of feeling... but I give the designers credit for trying something new at least. Also worth mentioning, fights are 1 round with no time limit (by default), also a non-orthodox layout for a fighting game. Even after 3 installments, unfortunately the "stiff & sluggish" nature of the gameplay is still apparent. 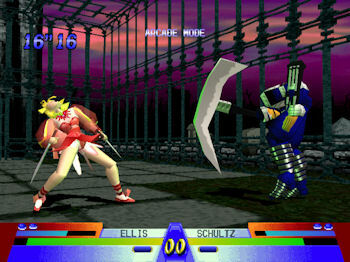 Compared to other 3D fighting games of the time, Toshinden 3 ends up feeling quite "aged". 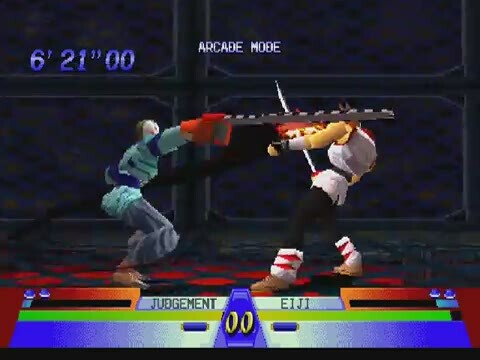 To me, one of the most unappealing aspects of Toshinden 3's gameplay is the fact that the super moves are incredibly easy to pull off... making for a seemingly "simplified" experience. 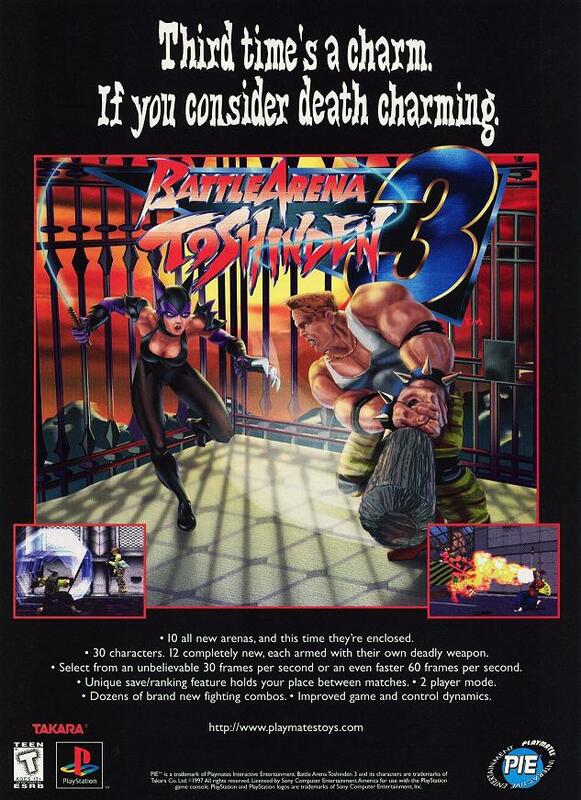 In a nutshell, Toshinden 3 wasn't nearly as technical as other 3D (and even some 2D) fighters at the time. As a console fighting game, it isn't a terrible package. The game features a decent variety of modes and a pretty cool (and rather lengthy) intro movie. 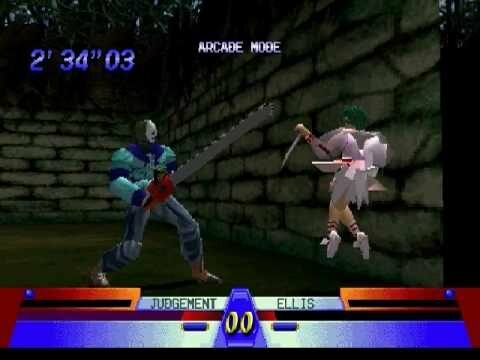 However, compared to some of the blockbuster console fighters of the era, such as: Soul Blade, Fighters Megamix and Tekken 3, Battle Arena Toshinden 3 was definitely lacking "something". 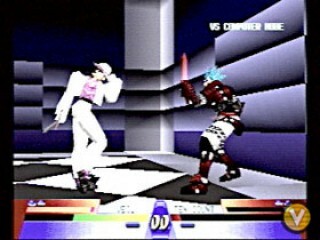 In fairness, Toshinden 3 did seem to offer more content than a few of the other "me too" 3D fighting games of the era. 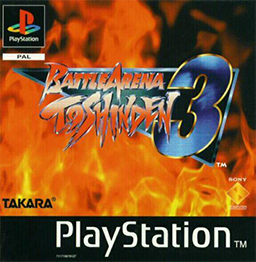 At the very least, Toshinden 3 brought some nostalgia to those that enjoyed the first two titles. Yes, Michael Jackson is in this game. Worth mentioning, Toshinden 3 features a (laughable) graphics selection mode... pushing that poor PS1 hardware to its limits. Strangely, the game is set on "30 frames per second" by default, but the blocky backgrounds & characters receive slightly enhanced resolution & textures. However, the 30 FPS frame rate (and gameplay) is noticeably sluggish on this setting. The other (preferred) option is playing the game at a smooth "60 frames per second," but this significantly lowers the graphics/texture quality. In either case, graphically, Toshinden 3's visuals leave much to be desired. The elaborate character designs & cool artwork for this game paint a very different picture than the actual in-game graphics. 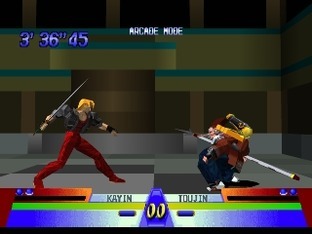 In some areas, the original Toshinden actually looks better than Toshinden 3... (how is that even possible?). 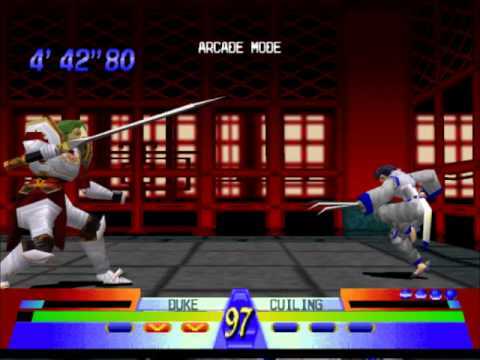 For example, the unnecessarily "colorful" HUD on the bottom of the screen is pretty annoying, if you ask me... those actually might be the ugliest life bars in fighting game history. It seems like Takara was trying a little too hard to make Toshinden 3 "different" from other fighters. Furthermore, the wall & floor textures also sometimes clash in a vomit-inducing way. I give the game some style points here and there, but other 3D fighting games of the generation were doing it better in the graphics department. 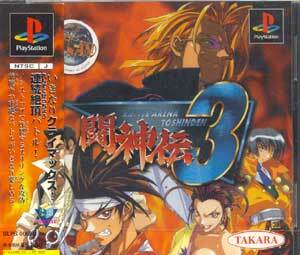 The North American and European releases of Toshinden 3 featured several differences to the original Japanese release. For one, blocking high or low was made automatic in the US & EU releases (pressing back would block both block high & low attacks). 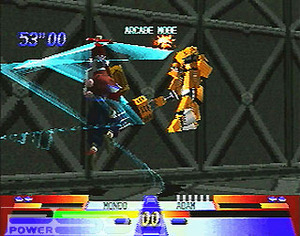 In the Japanese version, however, players have to press back & down to block low attacks. This small difference actually made a significant impact on character balance, arguably breaking the game. When hit by a reversal attack in the Japanese version of the game, how far your character flies is determined by his or her weight. In the US & EU versions, all characters fly the full length of the arena. Final Words: Third times a charm? Not quite.... Toshinden 3 packs some nostalgia value for fans of the first 2 installments, but it's certainly not the best of the series. 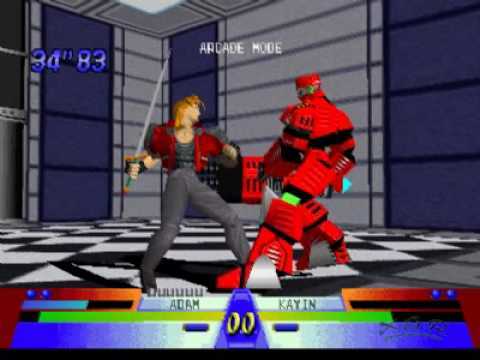 While it was nice to see the Toshinden series "still around" in 1997 (especially considering how insanely competitive the fighting genre was becoming at that time), Toshinden 3 left a lot to be desired as both a competitive and console fighting game. Toshinden 3 has an interesting and impressive roster, for sure. As previously mentioned, most of the unlockable fighters share a lot in common with the core characters' movesets (so the roster isn't quite as big as it seems). On the bright side, there are a few memorable character designs and impressive special / super moves to check out in this installment.